Subtitle: The Bible is very specific about most types of human behaviors, in order that God may protect us against both ourselves and against wicked and evil in this world. Scripture gives very clear commands that would prevent anyone from ever joining a secret society like Freemasonry. Once reading these Biblical commands, you will realize that no one can be a member of Freemasonry and be obedient to Jesus Christ. John 18:20 -- "I spake openly to the world; I ever taught in the synagogue, and in the temple, whither the Jews always resort; and in secret have I said nothing." Throughout Scripture, we are told to imitate Jesus Christ, and let Him serve as our example. Thus, since Jesus Christ never, ever did anything in secret, we are not to do anything in secret, either. The true Christian walk is to be the utmost in transparency possible. But, in Masonry, initiates are forced to take the most terrible oaths of secrecy, which we shall get to in a minute. First, let us examine Jesus' commands against taking any kind of oath. Notice that Jesus Christ personally forbade taking any kind of oath, based upon anything on earth, or in the heavens. Matthew 5:34-46 -- "Again, ye have heard that it hath been said by them of old time, Thou shalt not forswear thyself, but shalt perform unto the Lord thine oaths: But I say unto you, Swear not at all; neither by heaven; for it is God's throne: Nor by the earth; for it is his footstool: neither by Jerusalem; for it is the city of the great King. Neither shalt thou swear by thy head, because thou canst not make one hair white or black. But let your communication be, Yea, yea; Nay, nay: for whatsoever is more than these cometh of evil." This Divine command, if followed by the "Christian" Mason, would absolutely prevent any Christian from ever, ever becoming a Mason. Jesus makes it quite plain He is speaking of "oaths" in this passage, and for very good reason. Secret Societies had sprung up in ancient Babylon and Egypt, more than 1,000 years before Jesus Christ was born. These societies had developed the same type of elaborate secrecy, protected by the same oaths and secret handshakes that Freemasonry employs today, and for the same reason: if the average person in any society knew what these secret societies were really worshipping, and what they were really planning, they would have erupted into demands for public suppression of the secret societies. Focus in now on Jesus' last words, above: "... let your communication be, Yea, yea; Nay, nay: for whatsoever is more than these cometh of evil." Therefore, these secret oaths "come from evil"! At the end of this article, we shall see how deep of an "evil" Freemasonry truly is. Obviously, this terrible oath violates God's Holy Bible in at least two ways. First, Jesus' commandment, above, to never enter into any kind of oath whatsoever is violated in a huge way. Jesus told us to never take an oath based upon anything in the universe, including our own head. Secondly, this secrecy oath violates John 18:20, also shown above. Finally, this oath symbolically violates the body, which we are forbidden to do! Listen: "What? know ye not that your body is the temple of the Holy Ghost which is in you, which ye have of God, and ye are not your own?For ye are bought with a price: therefore glorify God in your body, and in your spirit, which are God's." Obviously, this kind of bloody oath would glorify Satan, not God! But, now listen to the Apostle Paul shed a little different light on the fact that, in Jesus Christ's Second Covenant, God indwells the human body of the believer, just as He formerly indwelt the Temple in Jerusalem. "If any man defile the temple of God, him shall God destroy; for the temple of God is holy, which temple ye are." [1 Corinthians 3:17] Any man who takes this bloody oath volunteers his bodily destruction should he ever disclose what he learns as a Freemason. Thus, every Mason symbolically destroys his temple, in direct violation of Scripture! But, there is much more danger in this very first Blue Lodge Degree. First, the symbolism and the oaths come directly from the initiatory rite of the Satanic coven. When a candidate is blindfolded and led by a cable-tow around his neck at the hand of a Mason, he is being forced to act in precisely the same manner as a candidate who is being initiated into a Satanic coven! When he is then blindfolded, he is following the Satanic rite. When he is then partially disrobed with his right breast bare but his left breast covered; when his left foot is in a slipper but his right foot is bare, he is following the same symbolic path as a candidate in the first degree of a Satanic coven. 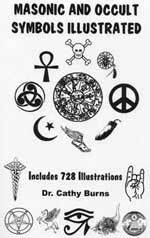 Much of the wording of the initiation comes directly from the initiatory rites of Satanism. The bloody oath is straight from the coven. Are you familiar with the bloody oath of the first degree? ""... 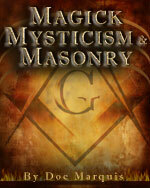 I will always hail, forever conceal, and never reveal, any of the secret or secrets of Masons or Masonry ... I solemnly and sincerely swear, with a full and hearty resolution ... under no less penalty than to have my throat cut across from ear to ear, my tongue plucked out by the roots and buried in the rough sands of the sea, a cable's length from shore, where the tide ebbs and flows twice in twenty-four hours. So help me God, and keep me steadfast in this, my obligation, of an Entered Apprentice." This bloody oath violates the clear command of Jesus Christ. Do you remember?
" "Again, ye have heard that it hath been said by them of old time, Thou shalt not forswear thyself, but shalt perform unto the Lord thine oaths: But I say unto you, Swear not at all; neither by heaven; for it is God's throne: Nor by the earth; for it is his footstool: neither by Jerusalem; for it is the city of the great King. Neither shalt thou swear by thy head, because thou canst not make one hair white or black. But let your communication be, Yea, yea; Nay, nay: for whatsoever is more than these cometh of evil." Let us review just a coupl of Freemasonry quotes that demonstrate the Antichristian nature of Freemasonry, again letting their own words tell the story. Did you understand this statement? Pike declares that it is a "monstrous absurdity" to believe in a Creator God, Who can create something from nothing. Therefore, Pike and Freemasonry are saying that the entire Biblical account of Creation is absolutely, 100% wrong, and is, furthermore, a story of "monstrous absurdity "! Once again, you can see that Freemasonry cannot be Christian. True to its lying nature, it claims to be Christian in the lower degrees, where they freely admit they lie to their own people, but in the higher degrees, Masonry teaches the opposite; they teach the Bible is all wrong, and when they do that, they cannot be Christian. We wish to give you one more example of how Freemasonry totally REVERSES the Biblical account of Creation. We will cover this account more completely in the next article on Masonic Double-Speak, but we include this quote here so you can see conclusively that Freemasonry IS NOT Christian, in any sense of the word. As we will demonstrate in our next article, Masonic Doublespeak , Pike is typically reversing the meaning of all the key words. We are thankful for this paragraph, for close analysis reveals that, to understand what Freemasonry really teaches we need to first understand that they have REVERSED all the meanings of the key words. Let us examine this Pike account with the Biblical account to see this MEANING REVERSAL. 1). Q. -- Who created Adam ? A. -- The Bible declares Creator God made Adam [Genesis 1:26-27]. However, in this paragraph, Pike declares that the Prince of Darkness created Adam. Yet, wait just a little bit, because this declaration in itself demonstrates our reversal of meaning. 2) Q. -- Who forbade Adam to eat of the fruit of 'knowledge of good and evil'? A. -- The Bible declares that Creator God forbade Adam to eat of this fruit [Genesis 2:17]. Yet, Pike declares that the Demons forbade Adam to eat of this fruit. Therefore, Masonry defines Creator God of the Bible as "Demons", and it is important to this discussion that Pike capitalized "Demons", signifying Deity. 3) Q. -- Who induced Adam to disobey and eat of this fruit? A. -- The Bible says that Satan, disguised as a serpent, induced Eve to eat of the fruit [Genesis 3:1-6]. Therefore, Pike defines Satan as an Angel of Light when he says that an Angel of Light caused Adam to eat the fruit! Further, note that Pike says this Angel of Light [Satan] gave Adam the "means of victory", but the Demons [Biblical God] outwitted Adam once again by creating Eve to "seduce" him. Not only does this passage by Albert Pike demonstrate Masonic Double-Speak, it also demonstrates Masonry's occult, Satanic, foundation by revealing they believe that the Universe has two Gods, one good and one bad, equal but opposite. But that is the subject of another article. 4) Q. -- Who created Eve? A. -- The Bible says that Creator God created Eve [Genesis 2:20b-25]. Yet, Pike says here that "Demons" created Eve. Therefore, Pike is consistent when he defines Creator God of the Bible as "Demons". Satan and the Serpent defined as "Angel of Light ", a term Christians ascribe to either God or Pre-Incarnate Jesus Christ. If you will keep this fact in mind as you read the writings of Freemasonry, you will be a lot closer to the truth of what they really teach. Much of their writings seem to read like they are speaking of the God of the Bible, and Jesus Christ, but if you understand they have reversed the meanings of the key words and terms, you will understand whom it is they really serve and worship. Make no mistake about it, and do not be deceived: when Freemasonry refers to God, they are really worshipping the serpent, and when they speak of goodness and light, they are speaking of the teachings of Lucifer, the Light-Bearer, whom they repeatedly refer to by that name. 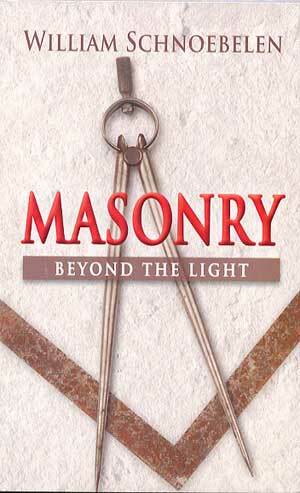 In fact, all Masons are charged with becoming "Light-Bearers", always moving toward the "Light". But, now, for the first time, hopefully, you will now understand that, with their reversal of meanings, Freemasons really worship Lucifer. Stay with us, for we will absolutely prove it later on. Right now, you can read FREE01, "Teachings About Jesus Christ", to see another example of Masonic Double-Speak. In upcoming articles, we shall quote Masonic authors directly that they serve Lucifer, and worship him rather than the God of the Bible. But, for right now, please meditate on what we have learned today, i.e., Freemason. Mason ry cannot be Christian! If you have learned this today, you have taken a long step forward in really learning the truth. At best, Freemasonry is counterfeit Christian; at worst, it is Antichrist. After you have read the entire series, we shall let you figure it out.